144 pages, A4 sized with a card cover, 20 period B&W photos and a massive 343 full colour shots. 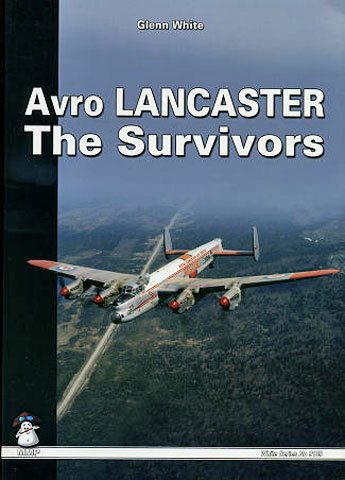 Covers all seventeen surviving Lancasters, with interesting and well-written text and excellent photography. Possibly of more interest to historians and aircraft enthusiasts rather than modellers, unless they wish to model one of the museum aircraft in which case there are many interesting interior shots to help them. There were 7377 built but only 17 survive today and all are in major museums around the world. We are talking, of course, about the Avro Lancaster, a World War II heavy bomber that we almost didn't get and which some believe was the best of the war. Modified from the failed Avro Manchester, it became the mainstay of RAF bomber Command for the second half of the war and served some over-seas air forces well into the 1950s. There are two in Australia, a whopping eight in Canada, one each in France and New Zealand, four in the United Kingdom and only one in the United States. Each is covered with a history from factory to museum, a few early B&W photos and a host of colour shots of the interior and exterior of before, during and after restoration. The majority are Canadian built, hence the number there, but only two had extensive WW II histories, 'S for Sugar' in England and 'G for George' in Australia, both having high mission tallies, 90 for 'George' and a staggering 137 for 'Sugar'. Four are ex French machines as France and Canada were the last two users, one in Western Australia, one in France, the Kiwi example and one in the UK. Only two are currently airworthy, FM213, Canadian Warplane Heritage Hamilton, Ontario and the Battle Of Britain Memorial Flight's PA474 seen regularly at UK air shows. In modelling, it is often stated not to rely on restored aircraft for reference purposes but if you want to model one of these museum Lancs, this book is perfect. You won't have to worry if the restorers have been historically accurate or not and there are plenty of full colour pix to show just what they have done. If you just want to know how cluttered and what detail existed in one of these aircraft, again, you can't go far past this one.